The mission of the Linux Virtual Server project is to build a high-performance and highly available server for Linux using clustering technology, which provides good scalability, reliability and serviceability. Currently, the major work of the LVS project is to develop advanced IP load balancing software (IPVS), application-level load balancing software (KTCPVS), cluster management components. These components make the LVS framework illustrated in the following figure. IPVS: is an advanced IP load balancing software implemented inside the Linux kernel. The IPVS code was already included into the standard Linux kernel 2.4 and 2.6. KTCPVS: implements application-level load balancing inside the Linux kernel, currently under development. 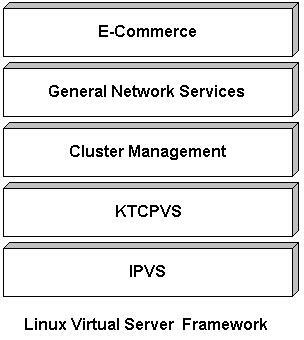 Users can use the LVS framework to build highly scalable and highly available network services based on a large number of commodity servers, such as web service, email service, media service and VoIP service, and integrate scalable network services into large-scale reliable e-commerce or e-government applications. The LVS framework has already been deployed in a lot of real applications all over the world. Please see the LVS deployment page for some LVS deployment that we know. Here are some comments from users that highly appraised the performance and reliability of LVS.